You may remember that during the 2008-2009 financial crisis, many called into question traditional economic models. Why did the traditional financial models fail? That's a crucial question to your financial well-being. This series gives you a well-researched answer. Here is Part I; come back soon for Part II. Every time there is a recession, observers grumble about economists' methods. The deeper the recession carries, the louder the grumbling. The reason that widespread complaints occur only in recessions is that economic forecasters as a group never, ever anticipate macroeconomic changes. Their tools don't work, but consumers of their commentary do not notice it until recessions occur, because that is the only time when everyone can see that the methods failed. The rest of the time, when expansion is the norm, no one notices or cares. The recent/ongoing economic contraction is the deepest since the 1930s, so the complaints about economists' ideas are the most strident since that time. Figure 1 shows how one publication expressed this feeling following four quarters of negative GDP. Ironically, once the economy begins expanding again, everyone forgets about their old complaints. The media resume quoting economists, despite their flawed methods, and they are once again satisfied that their ideas make perfect sense. Conventional financial theory relies upon the seemingly sensible ideas of exogenous cause and rational reaction. Papers are packed with discussions of "exogenous shocks," "fundamentals," "input," "catalysts" and "triggers." Stunningly, as far as I can determine, no evidence supports these ideas, as the discussion below will show. The Efficient Market Hypothesis argues that as new information enters the marketplace, investors revalue stocks accordingly. This is a simple idea and simple to test. But almost no one ever bothers to test it. According to the mindset of conventional economists, no one needs to test it; it just feels right; it must be right. 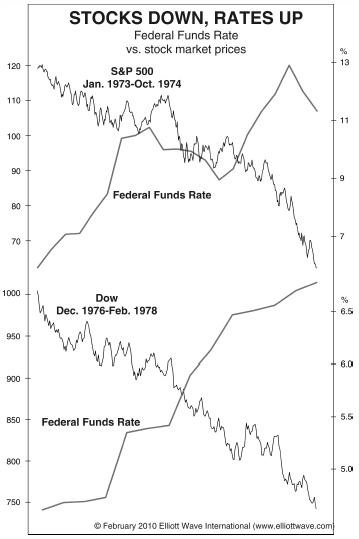 Claim #1: "Interest rates drive stock prices." This is a no-brainer, right? Economic theory holds that bonds compete with stocks for investment funds. The higher the income that investors can get from safe bonds, the less attractive is a set rate of dividend payout from stocks; conversely, the less income that investors can get from safe bonds, the more attractive is a set rate of dividend payout from stocks. This appears to be a sensible statement. And it would be, if it were made in the field of economics. For example, "Rising prices for beef make chicken a more attractive purchase." This statement is simple and true. But in the field of finance such statements fly directly in the face of the evidence. 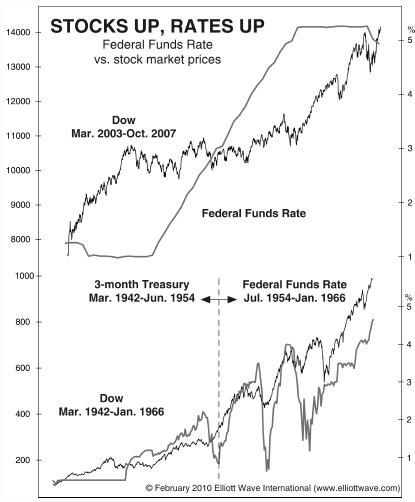 Figure 3 shows a history of the four biggest stock market declines of the past hundred years. They display routs of 54% to 89%. As in most arguments from exogenous cause, one can argue just as effectively the opposite side of the claim. It is just as easy to sound rational and objective when saying this: "When an economy implodes, corporate values fall, depressing the stock market. At the same time, demand for loans falls, depressing interest rates. In other words, when the economy contracts, both of these trends move down together. Conversely, when the economy expands, both of these trends move up together. 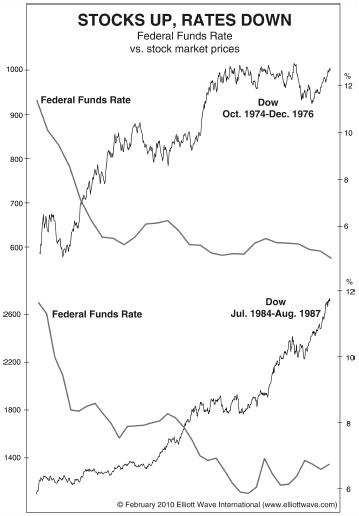 This thesis explains why interest rates and stock prices go in the same direction." See? Just as rational and sensible. On this basis, suddenly the examples in Figure 3 are explained. And so are the examples in Figure 4. Right? So you can't take the equally sensible opposite exogenous-cause argument as valid, either. And you certainly cannot accept both of them at the same time, because they are contradictory. To conclude, sensible-sounding statements about utility-maximizing behavior (per the first explanation) and about mechanical relationships in finance (per the second explanation) fail to capture what is going on. Events and conditions do not make investors behave in any particular way that can be identified. Economists who assert a relationship (1) believe in their bedrock theory and (2) never check the data.